What would happen if farmers could receive payments for providing ecological goods and services for the benefit of society? Three projects in Manitoba, Ontario, and Prince Edward Island are testing this idea. 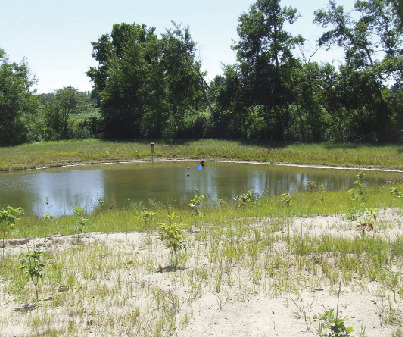 Work began in the spring on creating a wetland area on a farm in Norfolk County. What would happen if farmers could receive payments for providing ecological goods and services for the benefit of society? Three projects in Manitoba, Ontario, and Prince Edward Island are testing this idea. Under these alternative land use services (ALUS) projects, farmers receive annual land rental-type payments to provide native habitats and wetlands, native pollinator habitat, shelterbelts, drainage buffer zones, and other services above and beyond the legislated minimum environmental protection. So far, the response to this idea has been overwhelmingly positive. Also key to ALUS’s success is that although all three current projects are based on the ALUS concept, each is tailored to address local needs and concerns, local environmental conditions, and local values. The Manitoba project aims to prevent the disappearance of prairie pothole wetlands and riparian areas, which provide essential duck breeding habitat and flood control, and deals with nutrient leaching, salinity problems, and soil erosion. The Ontario project is providing wildlife habitat and addressing water quality, soil erosion, and climate change concerns. And the PEI project is tackling concerns with water quality, soil erosion, and fish and wildlife habitat. The ALUS concept was introduced in the late 1990s by Manitoba farmer Ian Wishart and the farm lobby organization Keystone Agricultural Producers. The first pilot project began in November 2005 in the rural municipality of Blanshard, located northwest of Brandon, Manitoba. “The purpose of this ALUS pilot project was to test the ALUS method of conservation delivery, asking will farmers accept it, how much land will they enrol, and what percentage of producers will be interested,” says Robert Sopuck, vice-president of policy for Western Canada for the Delta Waterfowl Foundation, who was involved in the project’s management. In the first sign-up period, more than 70 percent of eligible landowners enrolled and placed more than 20,000 acres into some form of habitat restoration. Participating farmers received annual payments of $5 per acre for managed grazing areas, up to $15 per acre for natural areas, riparian areas and wetlands removed from row cropping, and up to $25 per acre for specific ecologically sensitive lands removed from row cropping. Farmers had the option of leaving the areas alone or using them for controlled grazing or limited haying, with reduced payments for areas that continued to receive some use. The three-year project was administered by the Manitoba Agricultural Services Corporation, Manitoba’s crop insurance corporation. The pilot ended in December 2008. The results are being analyzed to evaluate the program’s effectiveness and can be used to fine-tune further projects. 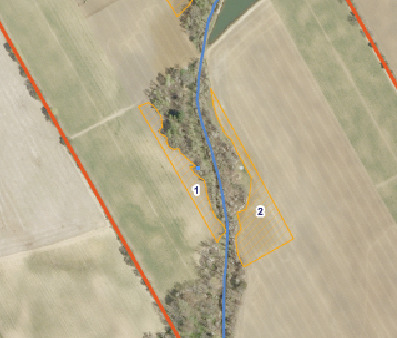 Aerial photographs show one demonstration farm where mixed tallgrass prairie species (areas 1 and 2) were planted to enhance the riparian zone of a waterway that runs through the farm. Additional zones of mixed tallgrass prairie (areas 3 and 4), a created wetland (area 6), and savannah (5) and tree plantings (7) act as a complex buffer zone for the waterway. In 2002, the ALUS concept was introduced from Manitoba to Ontario by the Norfolk Land Stewardship Council, which partnered with the Norfolk Federation of Agriculture to pursue a pilot project, explains Dave Reid, Norfolk Land Stewardship Council co-ordinator. 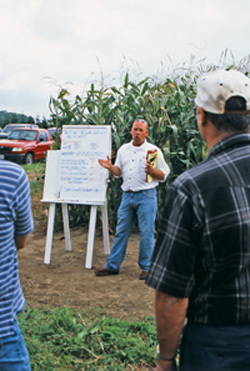 Between 2002 and 2007, the ALUS committee developed proposals, raised funds, hosted a workshop on evaluating predicted benefits, surveyed public opinion, and established four demonstration farms to exhibit the concept to farmers, the public, politicians, and potential funding sources. The pilot was opened to Norfolk farmers in the fall of 2007, and Reid says that it is targeting a variety of environmental improvements on farms over three years beginning in 2008. ALUS is not only tailored to different regions, the individual projects are tailored to each specific farming operation. The landowner decides what sort of projects will fit into his or her operation in consultation with ALUS technical advisors during site visits. Some of the projects that have been installed so far include native tallgrass prairie and oak savannah, windbreak hedgerows, stream and wetland buffers, created wetlands, reforestations, waterfowl and bluebird nesting boxes, and habitat for native pollinators like solitary bees. In Norfolk County, each farmer is responsible for performing basic site preparation and maintaining the installations such as by providing weed control while the native vegetation establishes. “We have a Norfolk Environmental Stewardship Team that comes in and plants the cover that’s agreed upon, whether it’s trees or grasses or pollinator habitat, or whether we’re constructing a wetland,” says Gilvesy. The ALUS program also pays the up-front costs of the establishment. In return, the farmer receives an annual payment, which, for the pilot, is based on the average local land rental rate of $150 per acre per year. “The farmer is in the program completely voluntarily and can get out as well,” says Gilvesy. “We have the farmer sign a simple conservation agreement that outlines the landowner’s and ALUS’s responsibilities, and that’s it.” If the farmer chooses to opt out of the three-year contract before it ends, a pro-rated portion of the up-front costs must be refunded. Even though the land is no longer in row crops, it can still help the farmer’s business of farming. “Ultimately, we are not getting the very best piece of farmland, but maybe the more marginal pieces, which for conservation are probably the most desirable,” says Gilvesy. “Each farmer has made his own decision that it’s better economically for him or her to put that parcel into environmental service, rather than to continue to crop it. I think that’s just a decision based on dollars and cents and the productivity of the site.” Other benefits to the business might include: increased numbers of native bees for pollination; late-season grazing of cattle or harvesting of biomass in tallgrass prairie, for which annual payments would be reduced because of the continued use; and “an image boost in your consumers’ eye that you’re doing something that’s beneficial for the wildlife,” says Gilvesy. Prince Edward Island is the first jurisdiction in Canada to have an official ALUS program across the entire province. And again, the program is somewhat different from the pilot projects in Manitoba and Ontario. “We’ve taken a concept that was developed in Manitoba and Norfolk and made it work for our situation,” says Shawn Hill, ALUS program co-ordinator for PEI. “We have seen the results from the pilot, an ecological goods and services pilot project that focused on two watersheds in PEI, and we are aware of the costs and environmental outcomes. Accordingly, we have moved beyond the pilot stage and have adopted ALUS as a fully funded provincial program across our entire jurisdiction.” The program is administered through the PEI Department of Environment, Energy, and Forestry, and was developed in consultation with community stakeholders, including public, agriculture, tourism, watershed and environmental groups, construction, and commercial fishing representatives. Because of intensive agriculture and serious environmental issues such as soil erosion and nitrate leaching into the groundwater, the PEI Department of Environment, Energy, and Forestry has traditionally been involved in a very regulated approach to the environment. The PEI ALUS program is funding several specific activities: reforesting buffer zones next to waterways, expanding buffer zones, establishing grassed headlands outside of buffer zones, retiring high-sloped land, and installing structures such as diversion terraces and berms to reduce soil losses. “Most of our rates are at $185 per hectare ($75 per acre) per year,” says Hill. “The high-sloped land is $100 per hectare ($40 per acre) to reflect the lower production value of high-sloped land. For land that’s used by soil conservation structures, we’re paying $250 per hectare ($100 per acre), and that number is a bit higher to reflect the decreased efficiency of the farming operation.” To arrive at these rates, an environmental economist surveyed producers in two watersheds to get a range of values for each activity, and the median rates were chosen. Although the program details differ among the locations, there are general consistencies to ALUS. For example, it does not target prime agricultural lands. Instead, it targets riparian and wetland areas and ecologically sensitive lands. The latter are defined as Class 4 to 7 lands that are at risk of severe water erosion, wind erosion, flooding, salinity, runoff, or leaching. And there is a cap on the proportion of land that each participant can enrol. In international trade agreements under the World Trade Organization, environmental programs such as ALUS fit into the green box category for agricultural subsidies and thus are unrestricted. However, Canada has been slow to take advantage. “Canada is the only industrialized country that does not have this kind of incentive program for landscape conservation,” states Sopuck. The United States, the European Union, Australia and New Zealand all have incentive-based environmental conservation programs for agriculture. Recent policy discussions and recommendations should be influencing the adoption of alternative land use services (ALUS) programs as national policy for Canada, suggests Robert Sopuck, vice-president of policy for Western Canada for the Delta Waterfowl Foundation. The June 2007 report of the Standing Committee on Agriculture and Agri-Food, which reviewed Agriculture and Agri-Food Canada’s (AAFC) Agricultural Policy Framework for 2003 to 2008, made two specific recommendations on environmental programs. First, that farmers be compensated for generating environmental benefits, that their stewardship role be recognized in the new agricultural policy and that federal-provincial cost-shared compensation be provided when the market does not support best management practices. Second, the committee recognized that other countries have such environmental programs and recommended “…that Canada’s agricultural policy include a voluntary program under which private agricultural land could be used as a tool for conserving and developing environmental resources,” with government-provided financial support for this land stewardship. As well, in December 2008, the Office of the Auditor General released a performance audit by the Commissioner of the Environment and Sustainable Development. The audit evaluated the management of the Environmental Chapter of the Agricultural Policy Framework. It stated that AAFC’s own evaluation of its Environmental Chapter noted both “slow uptake of the programs” and that “the number of projects funded and completed as of 31 March 2006 fell far short of targets,” although that improved to 75 to 95 percent of targets for most programs by 2008. In contrast, the uptake and implementation of the ALUS projects as they have become available has been swift, with much interest from farmers outside the project areas. And an ALUS-type program would appear to fulfill the recommendations of the Standing Committee.